Available in blue, pink, and green, the MSI PR210 seems destined to appeal to users who aren't excited by the looks of 12.1-inch systems from Lenovo and Toshiba but still want a relatively portable laptop. The colorful, 12.1-inch MSI PR210 offers a decent feature set and great battery life, but at least one similar laptop costs less. 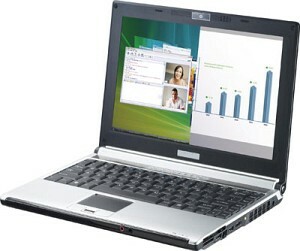 The MSI PR210 is a stylish, lightweight notebook with good battery life and decent performance for the price. Micro-Star International (MSI), perhaps best known as one of the top five motherboard manufacturers, recently announced its latest line of notebooks, the PR210 YA Edition. With models available in Coral Pink, Lime Green, and Denim Blue, the company hopes these systems will help consumers better "articulate their individualism." While we found that the PR210 YA Edition has some room for improvement, it could be a good fit for college students and hipsters who want to express themselves. The denim-blue cover of the 4.6-pound MSI PR210 is adorned with an ostentatious MSI logo surrounded by a silver ring (it's not as obnoxious as the rhinestone ring on earlier models). The first sign that this notebook is serious about work is that it comes with a fingerprint reader, so instead of entering a password to log on, you can set it up to recognise a fingerprint to grant access. A well-designed small notebook with some excellent features but home users will find it's not quite up to scratch. The MSI PR210 is a neat little number, which doesn’t fall far short on performance or usability. It is enjoyable to use and with the enhancement of a web cam, HDMI output and optional USB TV Tuner it a good multimedia all-rounder. As with all ultraportable PCs, the MSI PR210 can't offer the best gaming scores or raw speed, but we were won over by its compact design, high quality screen and lengthy battery life. MSI enters the ultraportable market with the PR210, a stylish and attractive laptop whose 12.1in screen allows the weight to be low enough to allow for frequent carrying. The MSI PR210's 1.8GHz AMD Turion 64 X2 processor offers enough power to run multiple applications without much of a struggle although, with a WorldBench 6 score of 55, it's hardly a speed demon. The MSI PR210's display is crisp and full of colour, and noticeably better than that of some of the other ultraportables we have reviewed. The MSI PR210's graphics controller is perhaps a touch lackluster though, and the games frame rate of 5fps (frames per second) was less than thrilling. Despite this, we can see the MSI PR210 working well as an entertainment laptop, particularly with the addition of the optional TV tuner. Muss es immer Schwarz oder Silber sein? AMD Turion 64 X2: AMD Turion 64 X2 hecha para ser posicionada en contra de Intel Core Duo fue presentada el 17 de Mayo del año 2006. El consumo de corriente no es más alto que el de las laptops con Centrino-Duo (TL-45 con ATI Xpress y Mobility Radeon X300). Esto significa, que aproximadamente el mismo runtime de batería y funciones de ventilador pueden ser esperadas (con este chipset). Sin embargo, el rendimiento fue menor al T2300 (1.66 GHz) por 20% debido al más bajo L2 Cache (Core Duo tiene 2048 Kbyte shared L2 Cache). No obstante, el rendimiento fue el suficiente. TL-56: Procesador dual core producido en 90nm (TDP de 33W) y 65nm (TDP de 31W) con una frecuencia de 1,8 GHz. El TL-56 aún se basa en el núcleo K8 y es comparable con un Core Duo de frecuencia más baja.